Designation: Department of Trauma and Orthopaedic Surgery, East Sussex Healthcare NHS Trust. List of Author(s): Tofunmi Oni, Pranab Sinha, Shalin Shaunak, Kalon Hewage, Ankit Desai, Jamie Buchanan. Copyright: © 2018 Oni T, et al. This is an open-access article distributed under the terms of the Creative Commons Attribution License, which permits unrestricted use, distribution, and reproduction in any medium, provided the original author and source are credited. The treatment of 3 or 4 part proximal humerus fractures is not only challenging but also has variable outcomes with no clear consensus on best practice in their management [1,2]. A range of conventional surgical management options includes open reduction and internal fixation, percutaneous pinning, hemiarthroplasty and Total Shoulder Replacement in those who have a functioning rotator cuff . The nature of these fractures is such that there is an increase in rate of avascular necrosis and revision if surgical fixation rather than replacement is performed . An alternative, which is historically a less commonly used option, is the reverse total shoulder arthroplasty. This option negates the need for a functioning rotator cuff, which is commonly the case in the elderly population who sustain these injuries. By moving the centre of rotation of the shoulder joint medially and distally, the reverse shoulder arthroplasty recruits the deltoid, using it as the primary muscle for range of movement instead of the rotator cuff. This was described and popularized by Grammont and Baulot in 1993 . We retrospectively reviewed 44 consecutive patients who had comminuted 3 or 4 part proximal humerus fractures managed acutely with reverse total shoulder arthroplasty (rTSA) (Figure 1). Patient with 4-part proximal humerus fracture. 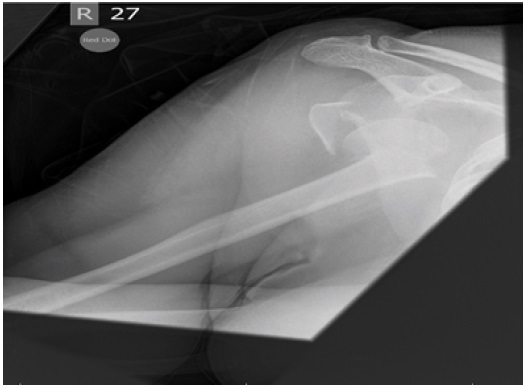 Figure 1: Patient with 4-part proximal humerus fracture. This was over a period from May 2013 to May 2017 using the ZimmerBiomet Comprehensive system (Indiana, USA). Inclusion criteria included three or four-part fractures as classified by Neer , which were isolated injuries in patients over 60 years old. We evaluated the postoperative range of movement, functional outcome and pain level in these patients in both shoulders. We assessed their outcome using the patient reported Oxford shoulder score (OSS) and measured postoperative range of movement using the Body Performance Measurement (BPM) sensor software which uses a inertia motion unit to stream live data interpreted as a live avatar. Pain level was measured using a visual analogue scale (VAS) . All procedures were performed by a single consultant surgeon and were performed under a general anaesthetic with regional block in the beach chair position. Standard operative technique was used to expose the shoulder joint via the Deltopectoral approach. The subscapularis was sacrificed and the proximal Humerus neck cut was made at the level of the lower border of the glenoid was the fracture fragments were removed. Standard approach and preparation of the glenoid was performed as per the implants surgical technique. The glenoid was secured with a central screw and supplemented with 4 locked peripheral screws [11-13]. 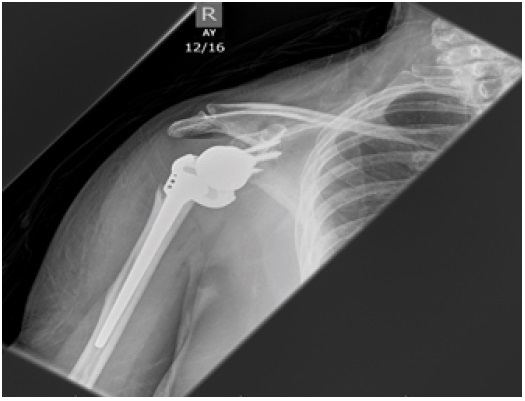 A cemented humeral stem was inserted and post reduction stability was checked prior to closure. Post operatively, patients were provided with a sling for comfort, however early range of motion was encouraged with physiotherapy guidance. Standard AP and Y-scapula radiographs were taken as shown in Figures 2 and 3, to exclude prosthetic misalignment or iatrogenic periprosthetic fractures. Post-operative ‘y’ scapula view with reverse prosthetic in situ. Figure 2: Post-operative ‘y’ scapula view with reverse prosthetic in situ. Post-operative AP views with reverse prosthetic in situ. Figure 3: Post-operative AP views with reverse prosthetic in situ. A total of 16 patients were followed up. The mean age was 74 years (range, 70 to 80). There were 16 women and no men included in the study. Ten patients had surgery within 6 weeks as primary reverse arthroplasty and six patients had surgery later than this period or after failed fixations. All patients were reviewed post operatively with a mean follow-up of 11.3 months (range, 7- 28). Mean postoperative OSS in the operated shoulder was 36 (range, 45-24). This was compared with a mean OSS of 43 on the non-operated shoulders. The mean active forward flexion (elevation) was 122.1degrees (range, 78-163) and mean extension was 18 degrees (range, 5-46). The software also analysed abduction, the mean of which was 120 degrees (range, 45-150), a mean active external rotation of 41 degrees (range, 23-52) and internal rotation mean which was 54.1 (range, 45-76). Interestingly we compared range of movement in operated versus non-operated shoulder and found only a mean 5.6 degree deficit in forward flexion, a 9.6 degree difference in abduction and a 9.8 degree deficit in external rotation. The mean visual analogue scale pain score was 2.25 (range, 0.1-8.1) compared with 1.25 (range, 0-6) on non-operated shoulder. The summary of clinical results is highlighted in Table 1. Table 1: The summary of clinical results. Complications were identified in 1 of 16 patients (6.25%) and this was an infected joint, which managed with was debridement, washout and implant retention with a course of antibiotics. There were no revision procedures, glenoid fractures, or cases of scapula notching during the follow up period. 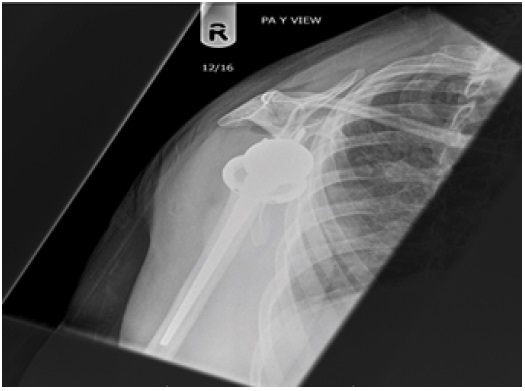 The early results in this study show that reverse total shoulder arthroplasty can be considered as a primary surgical management option for 3/4 part proximal humeral fractures. It gives some support to the ever-growing opinion that reverse total shoulder arthroplasty is an excellent surgical option in the management of these fractures. We have shown that patients achieve good pain relief and functional outcomes after rTSA. As part of the functional assessment we not only used patient reported outcome scores but also measured the range of movement of the shoulder using the Body Performance Measurements technology (BPM). The measurement of range of movement in other large joints such as the hip is easier to visually estimate with studies showing good inter-observer reproducibility . This has not been found to be the case in shoulder assessment  and we thought it imperative to our study to achieve accurate measurements. The BPM technology is comprised fundamentally of individually calibrated sensors located on the upper limb in pre -determined sites, as well as the analysis and visualization software. The hardware contains an inertia motion unit, which is composed of a 3D accelerometer, a magnetometer and a gyroscope. These help to detect linear, angular and rotational movements to allow a real time comprehensive measurement of range of movement of the shoulder. Another area this study differs to others is the fact that we did not repair the tuberosities into an anatomical position after prosthetic implantation. This is factor that has been postulated to be a main prognostic factor to good functional recovery . However, we have shown that patients get extremely good functional outcomes with relying solely on the prosthetic interface and deltoid for stability and function. The timing of surgery was a major factor to determine outcome in our study. We found that patients who had surgery within 2 weeks had an increased range of movement and better patient reported outcome scores than if they were operated on late. The same was true for patient who had failed fixation. This has been reported in the literature and we found the same . This study also found that the age of the patient was a determinant for functional outcome and this is well documented . The study reported by Wretenberg and Ekelund  looked at movements in patients with a mean age 75 years. They measured a mean range of movements all of which was worse than that obtained in our study in the similar age considering our mean age was 74. The complication rate also compared favorably with those reported for other treatment alternatives. With Neer and McIlveen  reporting a complication rate of 27% in patients treated with a hemiarthroplasty after trauma. In comparison we have shown a complication rate of 6.25% with the sole patient in the study being infected and no cases of dislocation or glenoid fracture or scapula notching, which has been reported in some cases after acute trauma . We have not only shown good functional outcome in patient reported satisfaction but also an excellent range of movement and good pain relief. It is also important to note the significance of mobilizing patient’s shoulders from day 1 if they have reverse arthroplasty. This is not the case in all other alternatives. Early mobility ensures that patients will have the better chance of return to premorbid state and also goes a long way towards decreasing the social burden of care that is needed in the postoperative rehabilitation period. The emergence of increasing evidence to support acute management of proximal humerus fractures with reverse arthroplasty also raises a pertinent issue about training of orthopaedic surgeons. The aging population in the UK has led to a rise in osteopaenic injuries of which proximal humerus fractures are common type. With regards to neck of femur fractures, this has prompted many to have the opinion that total hip replacements for trauma should be undertaken as part of the work load of a general trauma surgeon in active patients without cognitive impairment. If this model is followed, then it may not be unreasonable to suggest that with increasing proof of better functional outcome, reverse arthroplasty may need to become part of the repertoire of emerging general trauma surgeons. However, we appreciate that longer follow up of these patients is needed to ensure they have comparable outcomes to those carried out for elective surgery. Importantly there is some evidence that suggests that proximal humerus fractures especially in older patients should be treated non-operatively as there is not much difference in function outcome when compared to operative management. Much of the drive for this recently has been the PROPHER trial conducted in 2015 . However, it is important to note that only 4.4% of the fractures included in this trial were 4 part fractures, and associated dislocations were not included. This is compared with 43% of patients who has a 4 part fracture with or without dislocations in our study. We would suggest that a patient and fracture specific approach is taken into account when making the decision if to operate and a large group of these patients would benefit from a reverse total shoulder arthroplasty. We verify that all human and animal studies have been approved by the appropriate ethics committee and have therefore been performed in accordance with the ethical standards laid down in the 1964 Declaration of Helsinki and its later amendments.